From Naxos you have the chance to get to know the neighbouring island by participating in daily cruises. Santorini, one of the world’s most violent volcanoes, is the island with the unique landscape that for many is identified with the legendary lost Atlantis! 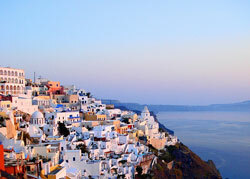 Take your camera with you and sail to Santorini! As soon as you arrive to the port, there will be a bus waiting to guide you through the island. Delos, a sacred place of the Greeks, the island where Leto gave birth to Apollo and Artemis is nowadays an open museum that attracts visitors from all over the world. 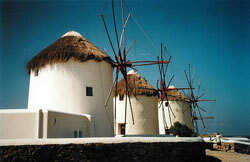 Across it, the noisy and cosmopolitan island of Mykonos, a legend of the world touristic reality. You have the opportunity to visit both islands in one day and savor the exciting contrast of these two worlds. Iraklia and Koufonissi are part of the Small Cyclades and were only recently «discovered» by tourism. Iraklia is rich in natural beauties, with various paths that lead to exceptionnal beaches. Koufonissi, the most famous of the Small Cyclades has only one burg that is a harbor as well. You can cover all distances on foot. All along the southern coast of the island there are wonderful beaches with beautiful stretches of golden sand that alternate with caves. Koufonissi is the ultimate fishing village since all of its inhabitants are fishermen while the fish served in the taverns is both fresh and abundant. Don’t miss the chance to get to know these islands’ primitive beauty.